This is a closeup of an embroidery I did for a bag. Now I think it is too delicate and am planning on making it into a bedroom pillow. It is a Kris Richard’s design called “All Roses” from the book “Embroidered Bags and Purses”. I love doing this type of embroidery since it is such a challenge. I changed the threads to DMC floss because it is easier for me to find. I had to mix the colors for the hydrangeas. The pattern called for an expensive brand of variegated floss I thought was rather dull looking, after searching and finding it at a local needlework shop. There is a photo of the whole design on my flickr photostream. This entry was posted on Tuesday, October 28th, 2008 at 12:09 am and is filed under Embroidery. 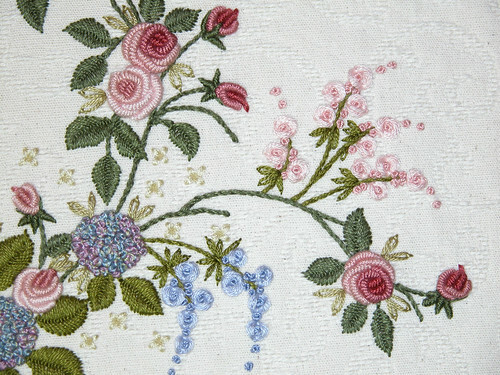 Tagged: Bullion Roses, Embroidery. You can feed this entry. You can leave a response, or trackback from your own site. Wow! I consider a french knot a success. Sweet dreams on that pillow case!